For the past three years at CES, I've met Razer CEO Min-Liang Tan and a grip of his colleagues in a large-ish suite in the MGM Grand. The first time, it was "Project Fiona" turning into the Razer Edge. Then in 2014, it was a crazy-looking modular computer codenamed "Project Christine." This year, there's no tease. No project name. 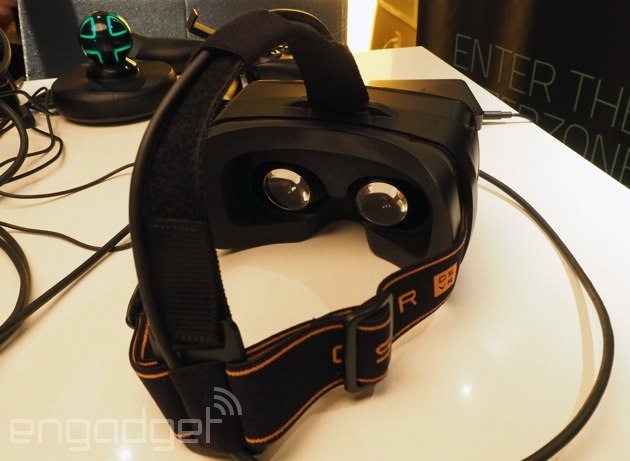 This year, Razer's announcing an open-source software and hardware initiative known as "OSVR." First: Yes, there's a headset, and yes, I used it. Second: That acronym stands for -- you guessed it -- "Open-Source Virtual Reality." The gamble is obvious -- and what a fitting place for its reveal, 20 floors above the MGM Grand's voluminous casinos. Razer's trading its research and development resources for the potential to accelerate the creation of the virtual reality market. Or, in English, Razer's trying to speed up virtual reality's realization. Tan and co. are hoping to "do what Android did for mobile," but with VR, Tan told me. Razer is releasing every detail of its virtual reality headset and the software that makes it work as open-source, enabling developers, makers and other enterprising individuals to create their own versions. The company's also making and selling its own "Hacker Dev Kit", set to debut sometime between now and June. "By June" is how Tan puts it -- he's all about the push to consumer virtual reality. Our discussion of OSVR began with a preface: he's tired of VR's current development kit/prototype limbo. That's why his company's betting on the community, he says. They can take the current schematics and add betters screens, different lenses, eye-tracking, cameras, or any other accoutrement. He's hoping that not just individuals, but companies will use Razer's R&D to jumpstart work on VR. From this, he's hoping an industry will blossom, built on the foundation laid with OSVR. It's a lofty goal, and a decidedly different turn for a company known most as an expensive, quality hardware maker. I tried two different demos using Razer's VR headset, neither of which was intended to impress. As is the case with all VR headsets at first, the content isn't meant to stun you with its depth. It's meant to demonstrate that, yes, this is a working VR headset. In that respect, OSVR's "Hacker Dev Kit" is entirely functional. It's not the most comfortable, and it's not the prettiest, and the screen (a 5.5-inch FHD display) isn't perfect. It's got a small square box that connects from the headset to your computer, which Razer reps suggested I clip on my back pocket. I did that, twice, and it was weird both times. That's not something I'd want to deal with at home. There's also a USB port on the headset itself, enabling attachment like Leap Motion (which one of Razer's demos actually used). Rather than use one set of lenses, Razer's employing one set of concave and one set of convex. The effect is solid, and "edge distortion" (the edge of your vision appearing blurry while in VR) is nearly nonexistent. That is by far the most positive thing I can say about my experience with OSVR's test prototype, and it's the one element that feels like an innovation in VR technology. The two demos -- one of skulls flying at me, another where I was a giant robot menacing a city -- were fine. Neither allowed for depth-tracking, though Razer says it's part of the OSVR package. You can even use your own webcam, Tan tells me, but I've yet to experience it myself. The experience was akin to a low-level version of Samsung and Oculus' Gear VR headset. This is not the next big step in VR you're looking for, nor is it intended as such. Razer's not using the latest, nicest screen in its headset. It's hoping that someone else will, though, and that that someone else will also run Razer's software. That's the long play -- the gamble -- that Razer's making.